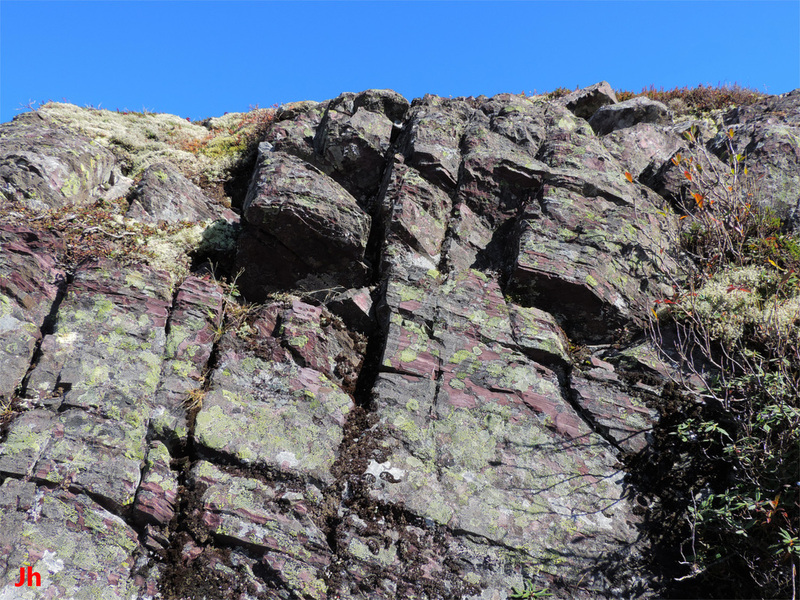 In a regionally metamorphosed environment, bedding planes in sedimentary rock can be confused with planes of weakness caused by tectonic compressional stress and/or shear stress. In fine-grained phyllosilicate-rich sedimentary rocks, tectonic stress can realign crystal grains to produce slaty cleavage or cleavage resembling that of shale . The resulting aligned cleavage planes have strike and dip determined by directed tectonic stress at time of crystal alignment and by the effects of subsequent folding. Original bedding planes in sedimentary rocks that have undergone low grade regional metamorphism can be recognized by observing layers of differing color or grain size. However, bedding planes cannot be conclusively identified by observing only failure surfaces or patterns of cleavage or jointing. 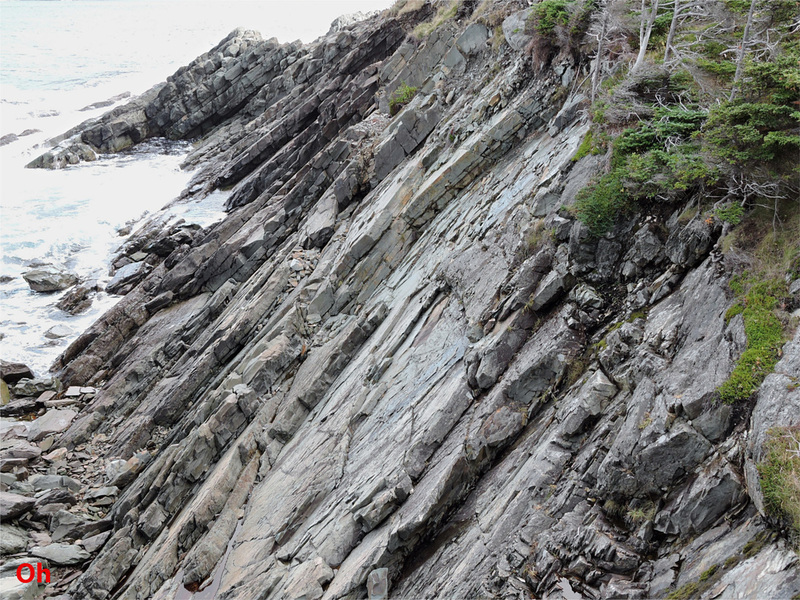 Gently folded bedding planes are clearly delineated by color differences between layers of Cambrian siltstone and sandstone in the above-pictured coastal cliff. Although little evidence of jointing along the bedding planes is apparent, the overall shape of the top surface of the landform seems guided by the bedding. Weak layers of sediment, such as clay-rich silt, deposited between strong layers, such as silica-rich sand, can generate persistent planes of weakness that withstand subsequent low-grade metamorphism. 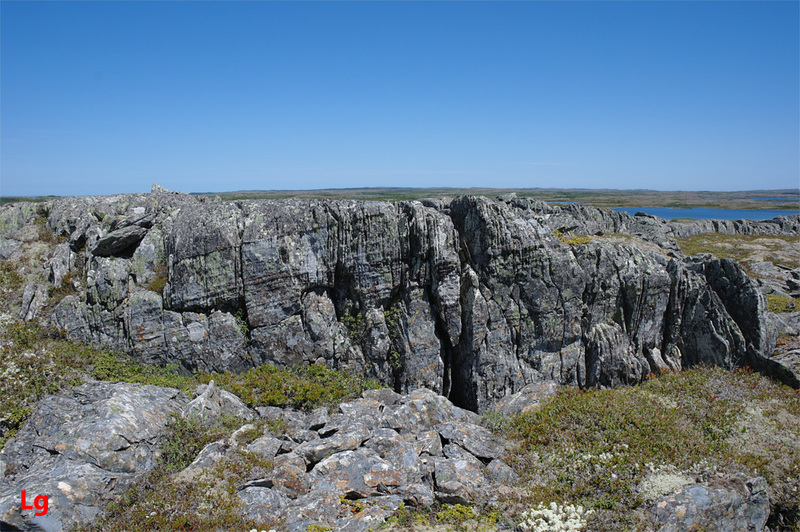 Note that this rock outcrop includes vertically-dipping failure planes and corresponding parallel cleavage and joints caused by compressional tectonic stress. Glacial plucking and frost weathering have loosened joint blocks from the face of the ridge shown above. 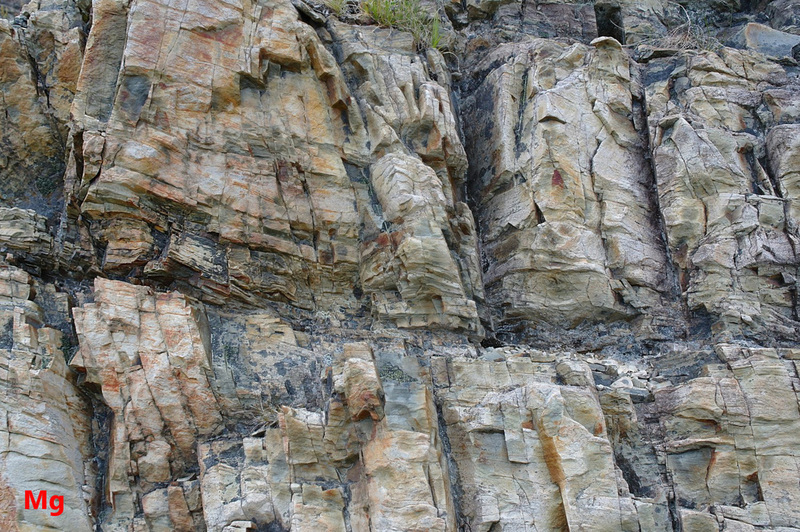 The joint blocks are bounded by a set of tectonic cross joints (left-right), tectonic longitudinal joints (front-back) and bedding planes (top-bottom) in the alluvial sedimentary rock. Erosion along weaknesses between bedding planes (bedding planes dip away from the camera at about 20 degrees) is responsible for the terraced shape of the ridge. 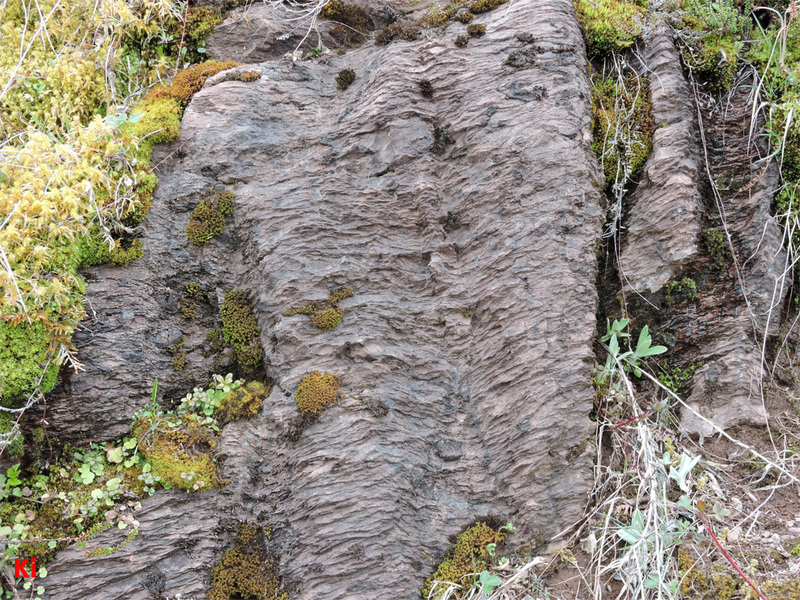 Bedding planes are evidenced by small changes in the color and tectonic cleavage of the rock as can be seen by careful examination of the left-center side of the lower terrace. Layered variations of color and composition clearly highlight bedding planes in the glacially-eroded feature shown right. The sedimentary beds in this area lie on the limb of a large fold and form a homocline, or region where beds dip at a constant angle over a wide area. 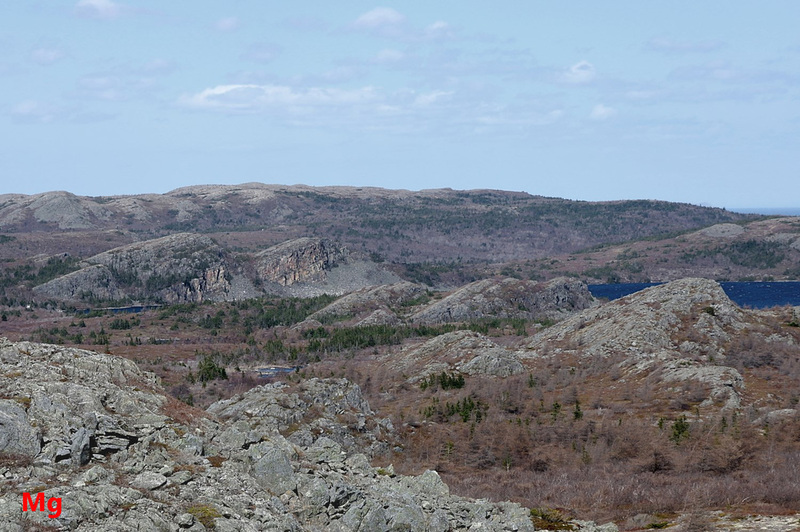 The larger photo above, which includes the hill pictured right, shows several cuestas, all carved out of sloping beds of alluvial sedimentary rock by glacial ice moving left-to-right. The co-alignment of the up-ice surface of the cuestas with the clearly visible bedding layers in the background hill helps identify these foreground surfaces as having formed on bedding planes. Note the distinct tectonic jointing (both cross jointing and longitudinal jointing) evidenced by the angular eroded surfaces on the front and side of the hill shown right. The rapidly weathering cliff face (about 3 m high) in alluvial sedimentary rock (top right, detail top left) pictured above shows jointing along bedding planes as well as tectonic jointing in multiple directions. 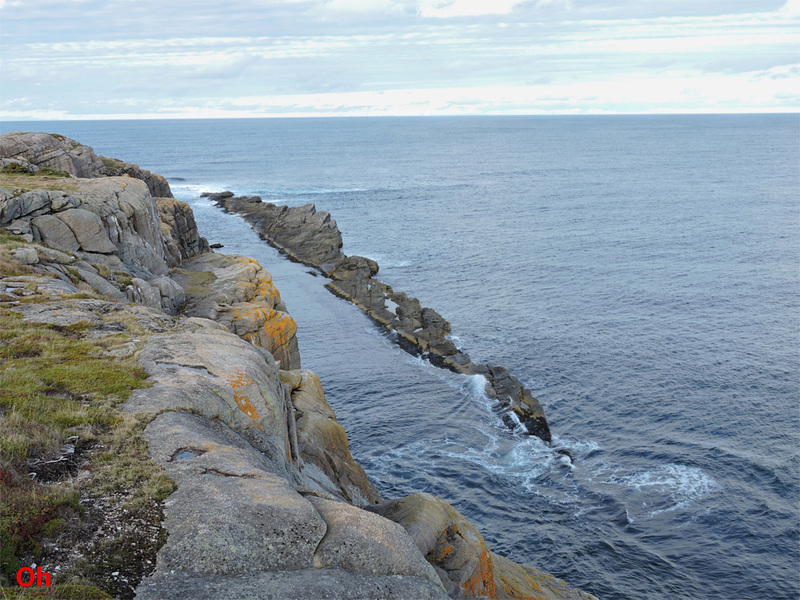 Rocks from the cliff are shown left and right below. The lower left photo shows a breakage surface (facing left and toward the camera) parallel to the bedding. Careful examination of the sides and top of this rock (surfaces normal to the front surface) shows indistinct colored layers paralleling the front surface. The flat surface showing on the rock at center of the bottom right photo is a surface of tectonic fracture, with colored bedding layers visible at right angles to the exposed surface. 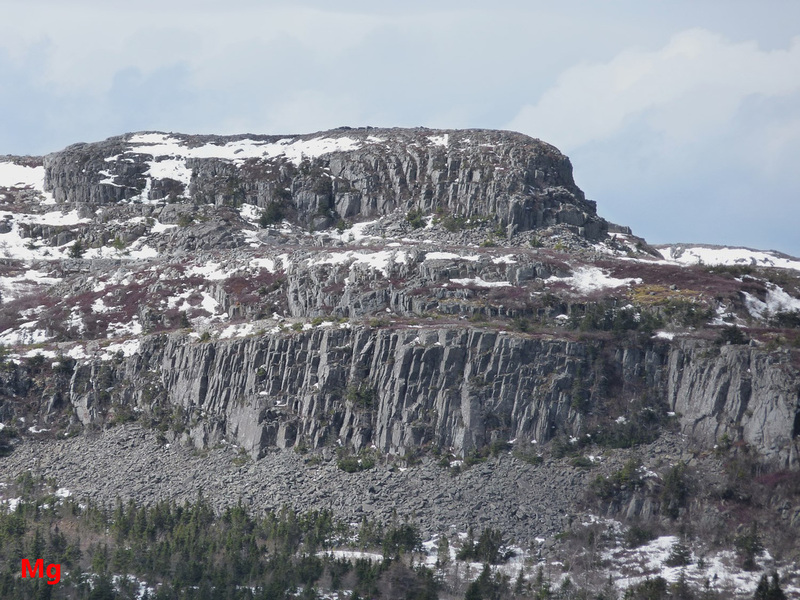 Bedding planes are clearly visible as sloping lines on the rock face shown above. 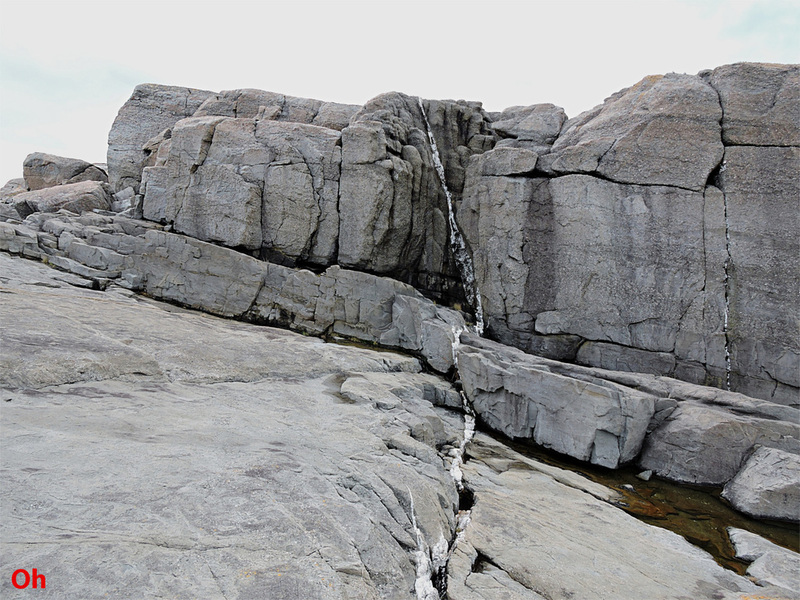 The rock face (about 3 m high) is a glacially eroded failure surface following tectonic cross jointing in alluvial sedimentary rock. Much of the sedimentary rock in Heart of Avalonia is very well indurated, in part by the pressure and heat of regional metamorphism. This regional metamorphism can obliterate planes of weakness parallel to the bedding and the rock in the above-pictured feature appears to show little tendency to fracture or erode preferentially on the bedding planes. The lines etched into the surface of the rock face by rainwater and lichen are made visible because of different solubilities (hence different erosion rates) of different sedimentary layers. The fluvial sedimentary rock shown above has wavy bedding planes which frequently form failure surfaces in this frost-weathered bedrock exposure. The bedding-plane weakness is strongly overprinted by tectonic cleavage at a low dip angle. The presence of color bands revealing bedding layers helps make it possible to determine whether an exposed surface is a bedding surface or a cleavage surface. Additionally, the bedding surfaces have a notable wavy profile that is lacking in the cleavage surfaces. 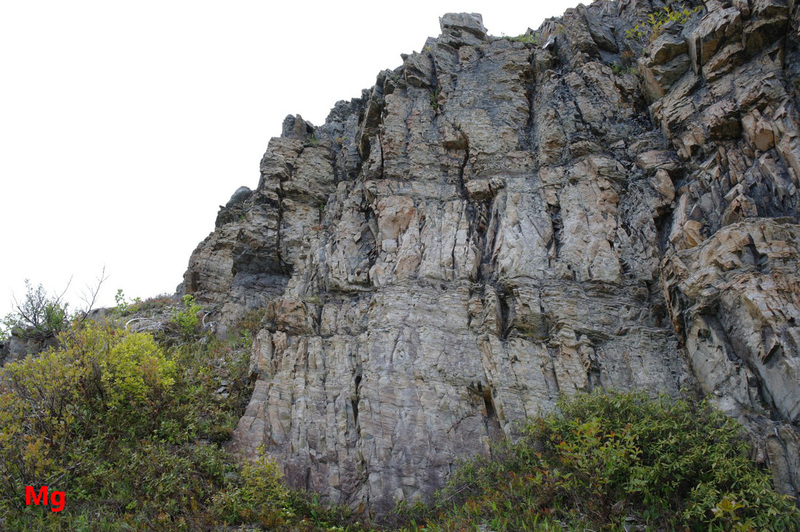 The above-shown outcrop of shale (1 m high) has been overprinted with compressional tectonic cleavage. 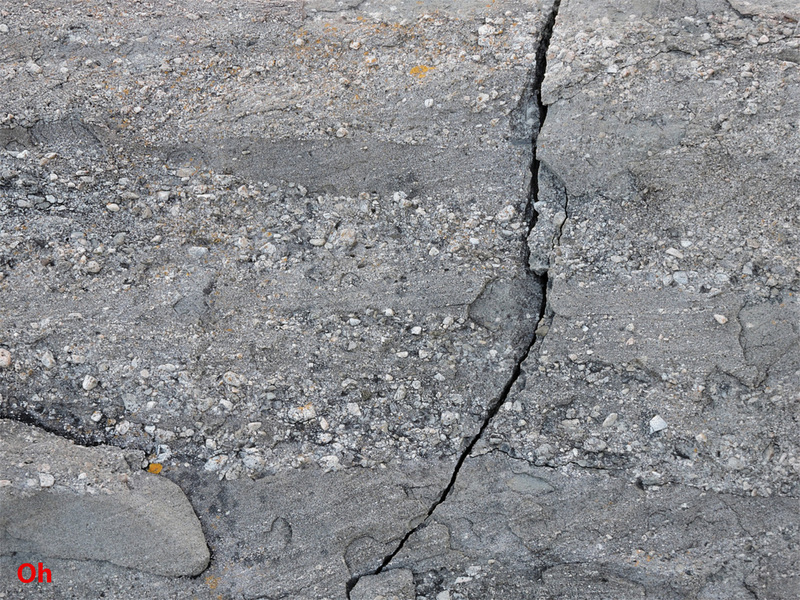 The chaotic pattern of the cleavage illustrated is the result of rainfall and groundwater etching the rock along planes of weakness that may be bedding-related, or tectonic, or a combination of both. The cleavage is somewhat indistinct, with the rock fracture-resistant and readily breaking across cleavage planes. 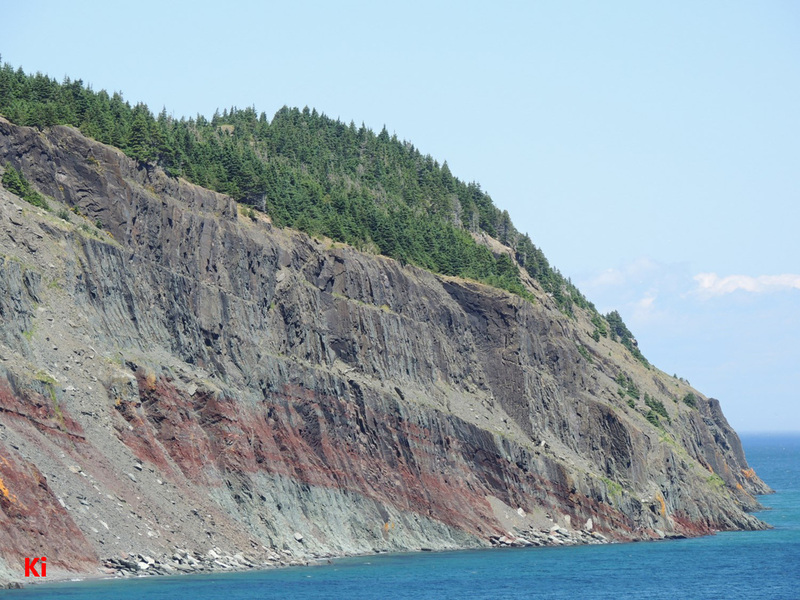 The red siltstone pictured above (height of cliff 2.5 m) readily cleaves along bedding planes although the rock lies within 2 m of a thick basalt dyke. Heat from the igneous intrusion has metamorphosed the sedimentary rock and evidence of metasomatism is seen in a dense pattern of thin veins permeating the siltstone. Furthermore a longitudinal tectonic joint set is present, as seen at right angles to the cliff face. 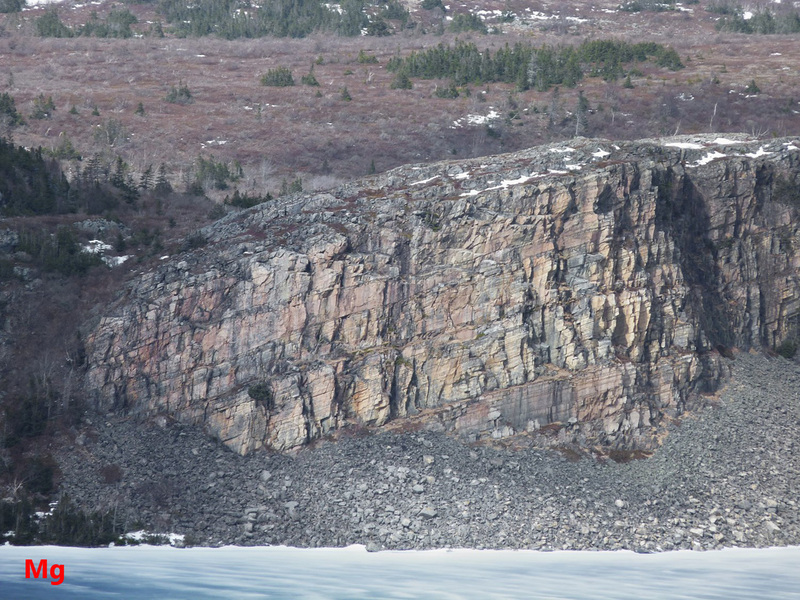 The cliff itself was cut by glacial ice eroding the rock along a plane of weakness originating in tectonic cross jointing. 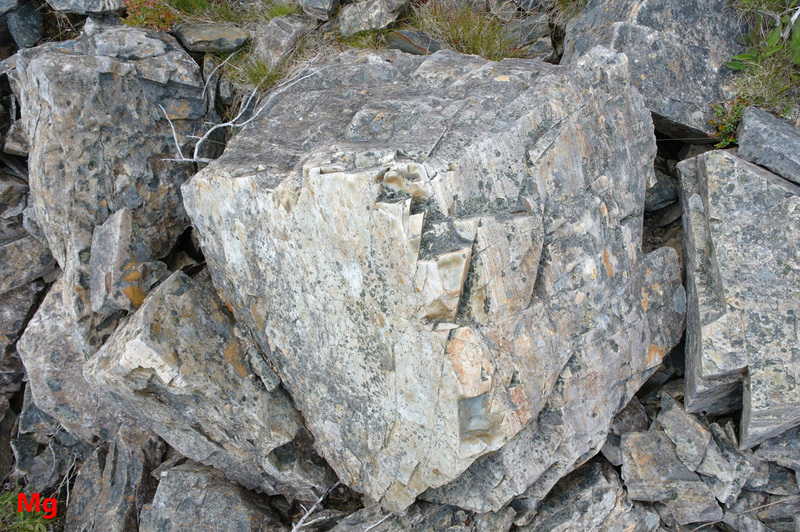 The bedding-plane cleavage in this rock could be expected to have been obliterated by metamorphism, but instead was preserved because of compositional differences in beds, with weaker layers interspersed between stronger layers. 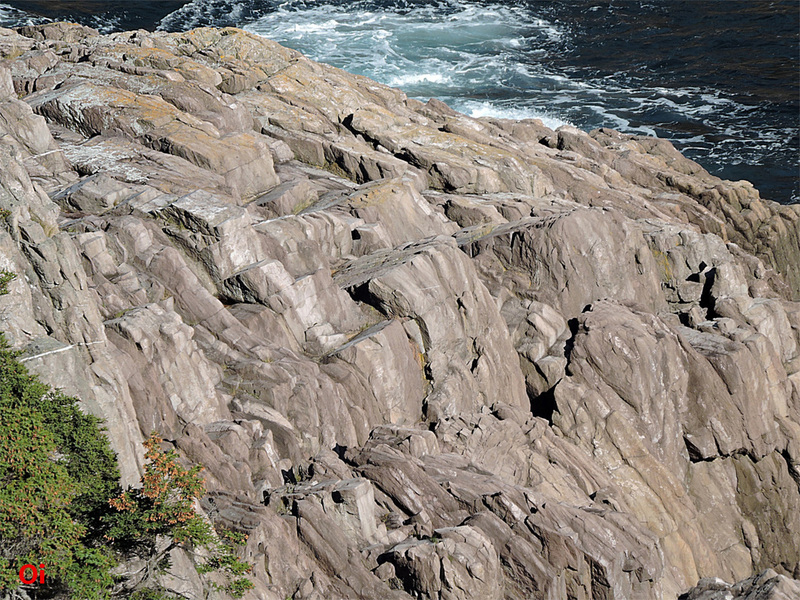 Wave erosion has revealed a complex pattern of weaknesses in the above-pictured coastal rocks. The bottom left photo shows rock with slaty cleavage of apparent tectonic origin. 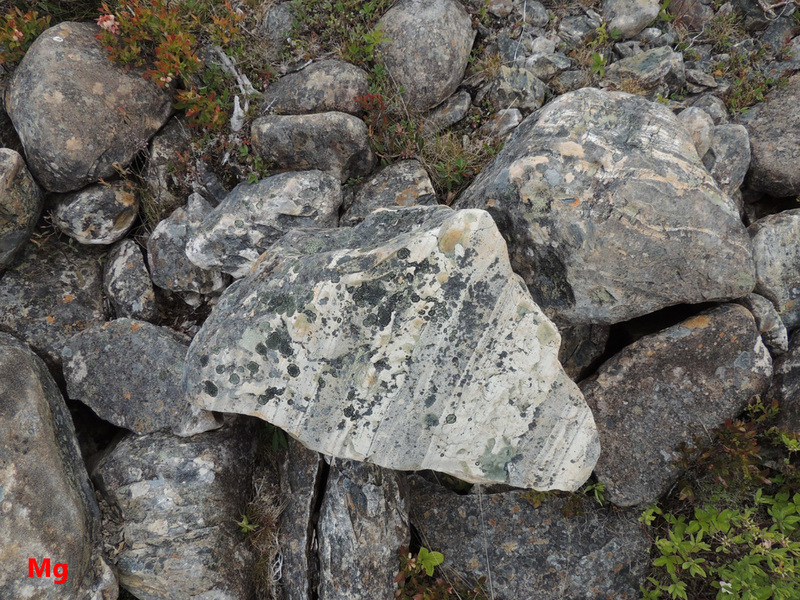 However, this cleavage is precisely in line with bedding planes that are made evident by layered color variations (best seen near the right of the photo). The slaty cleavage could be the result of shear fracture following weaknesses between bedding planes. The bottom right photo shows a rippled bedding plane surface. The ripples appear to be depositional in origin, but could instead represent wave erosion following tectonic jointing in the underlying rock. The top photo illustrates the combined effect of bedding plane weaknesses, rapidly varying zones of shear fracture and jointing from tectonic compression. These shallow-marine sedimentary rocks show little evidence of jointing due to regional metamorphism. 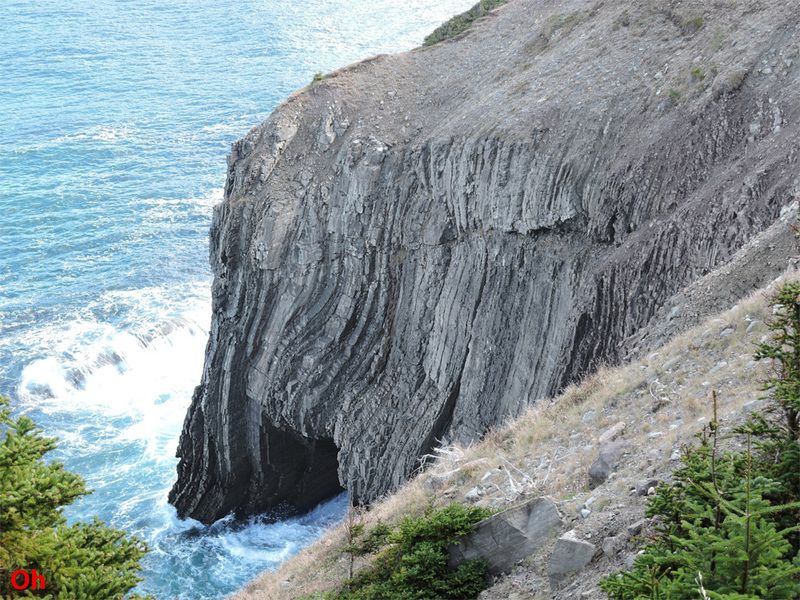 Ocean waves have eroded the rock along well defined bedding planes. Compositional differences and/or poor adhesion between successive layers of deposited sediment helped define the planes of weakness that were subsequently exploited by erosion. 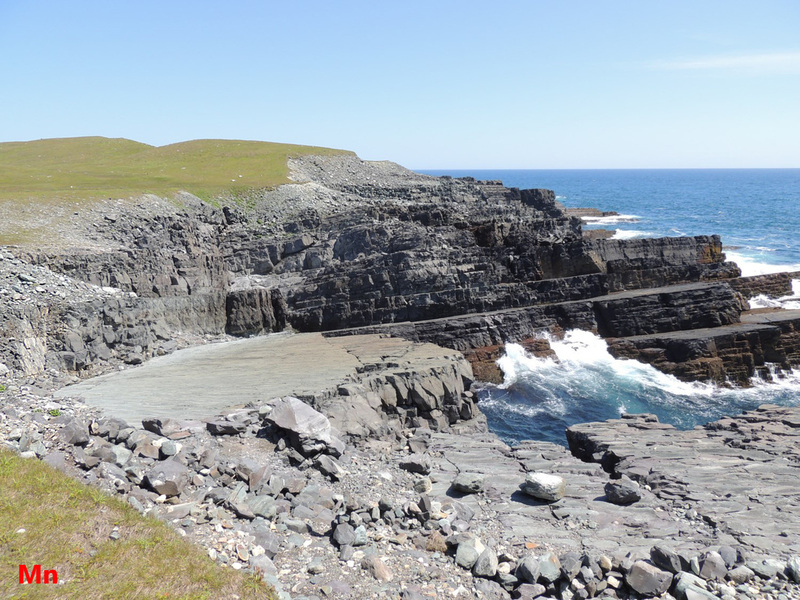 The photo above left shows the bedding plane (light-colored flat area, left, just below center) where the Mistaken Point Ediacaran fossils were found. This area was relatively unaffected by regional metamorphism, making fossil preservation possible. The right-hand picture shows a thin layer of dark volcanic ash, deposited through the water column, that defined a plane of weakness between successive siltstone beds. Wave action stripped away overlying sedimentary rock layers in bulk, cleaving the rock off at the poorly cemented ash layer. Then, water washing over the exposed bed etched the remaining ash and the underlying siltstone just enough to reveal the delicate fossils. The fossils are present at the surface only during the brief geologic interval between their initial uncovering by erosion and their eventual erasure as erosion progresses. 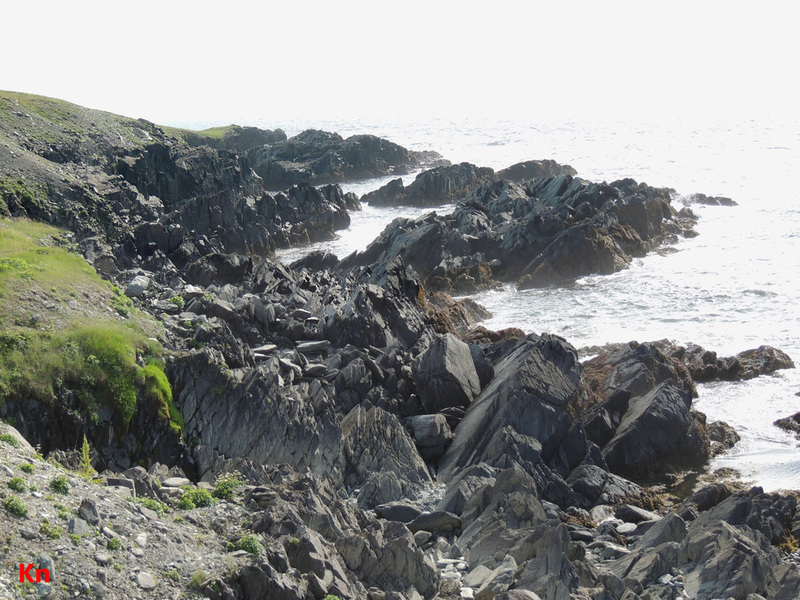 A tilted sequence of eroded sedimentary beds forms this coastal cliff at Fortune Head, on the Burin Peninsula. 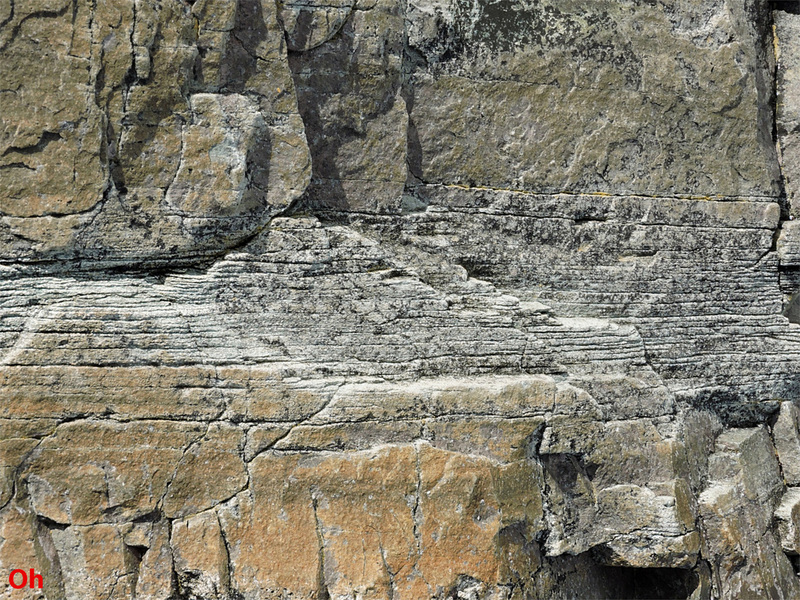 Although evidence of distinct tectonic jointing is present, the jointing is mostly orthogonal to the bedding planes, and the bedding planes themselves are planes of weakness. Erosion surfaces following bedding planes delineate the overall top surface of the feature and form the top and bottom surfaces of the eroded indentations on the sides of the outcrop. 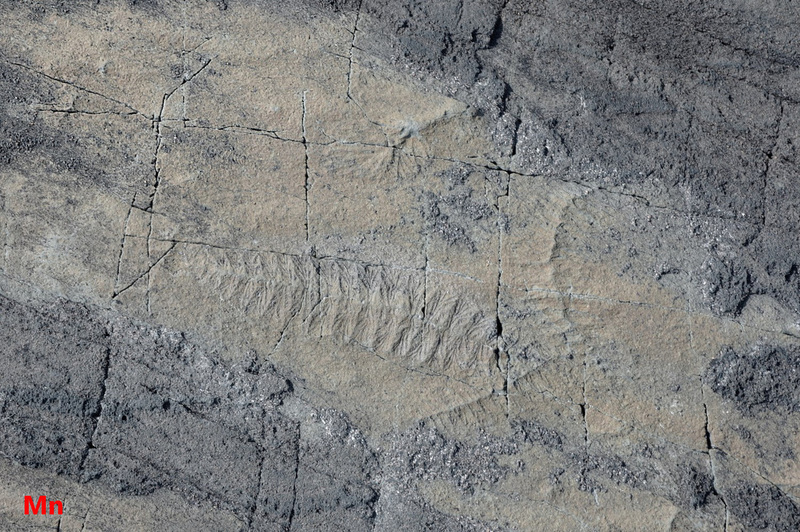 Fossils and trace fossils found in the exposed bedding surfaces of this sedimentary rock track uninterrupted deposition of layers of sediment during the late Ediacaran to early Cambrian periods. 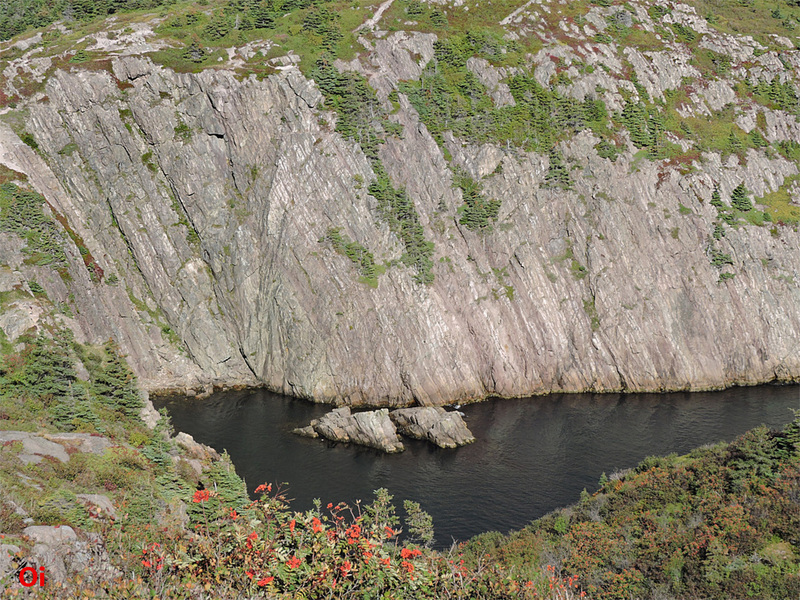 Although other contacts between Ediacaran and Cambrian rock occur in several areas of Heart of Avalonia, it is only at this location that the transition is continuous and not marked by an unconformity. Each of the four coastal rock exposures shown above reveal sedimentary beds with bedding plane weaknesses that have not been strongly overprinted by compressional or shear tectonic jointing. All of these rocks are on the limbs of folds, implying that they were subjected to tectonic compressional stress. Shear stress might not have been present or might have been insufficient to cause shear fracturing. The reason for the absence of distinct compressional tectonic jointing could be specific conditions of pressure, temperature or depth of burial during folding, or that the rocks lack platy phyllosilicate crystal grains. This second explanation would imply that the observed bedding plane weaknesses would be caused by interspersed weak and strong bedding layers or by weak adhesion between differing layers rather than by phyllosilicate grain alignment at time of sediment deposition. 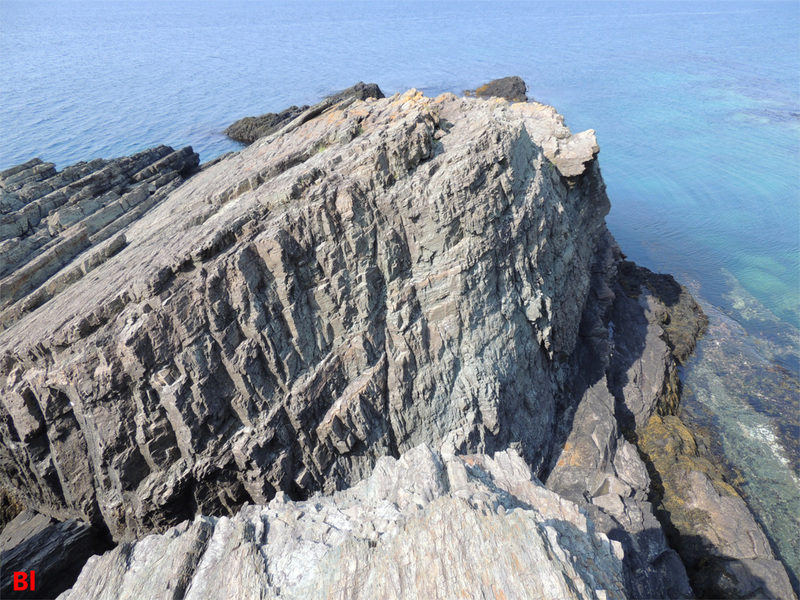 In three of the illustrated rock exposures (top left, top right, bottom right) wave action has eroded the rocks along the steeply sloping bedding planes which parallel the shore. The strike of these steeply dipping beds guide the direction of the shoreline. In the bottom left instance, wave erosion has cut an indent into the coast almost at right angles to the strike of the bedding. 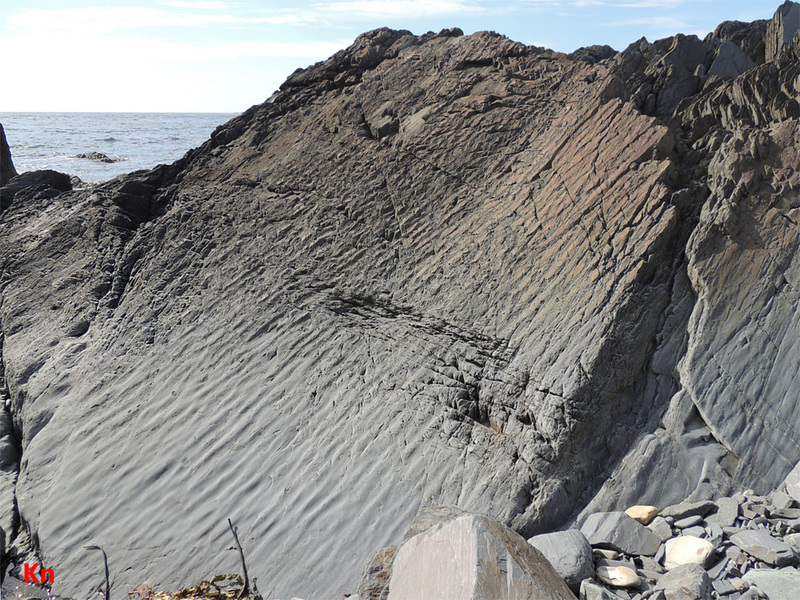 The curved shoreline of the indent suggests that this erosion was not following a tectonic plane of weakness. 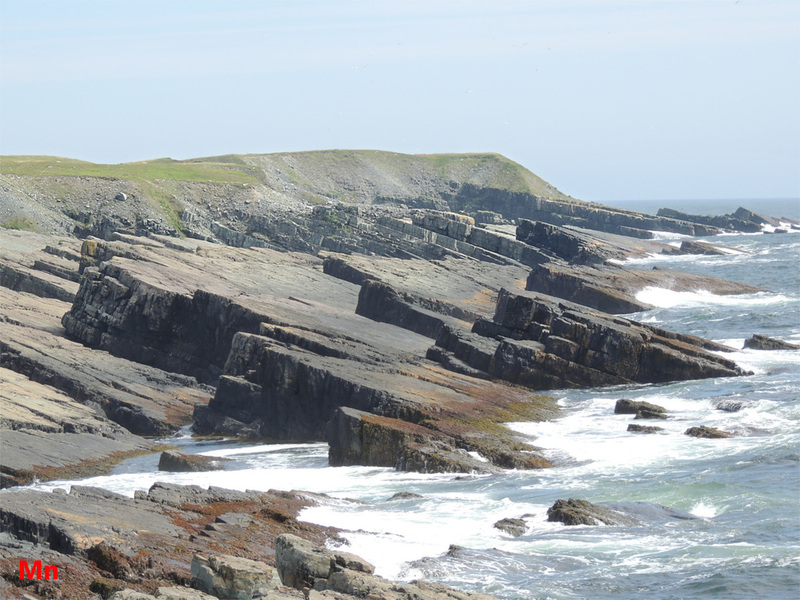 Each of the strongly folded sedimentary rock outcrops pictured above could be expected to show distinct shear fracturing and tensile fracturing as successive beds were forced to conform to differing radii of curvature. 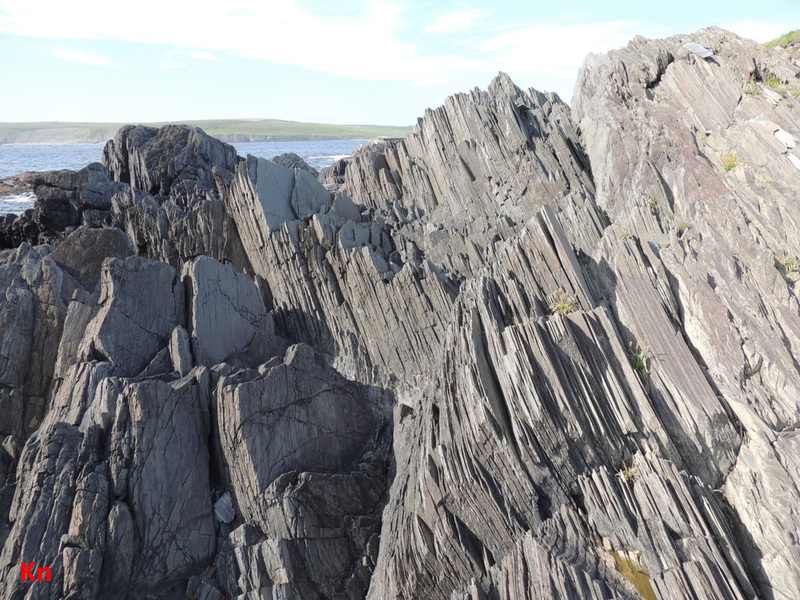 The absence of abundant tectonic jointing implies that folding took place under sufficient depth of rock, hence hydrostatic stress, to inhibit fractures from opening. Furthermore, layers of easily shear-deformed clay minerals may have accommodated slippage between more resilient adjacent layers. 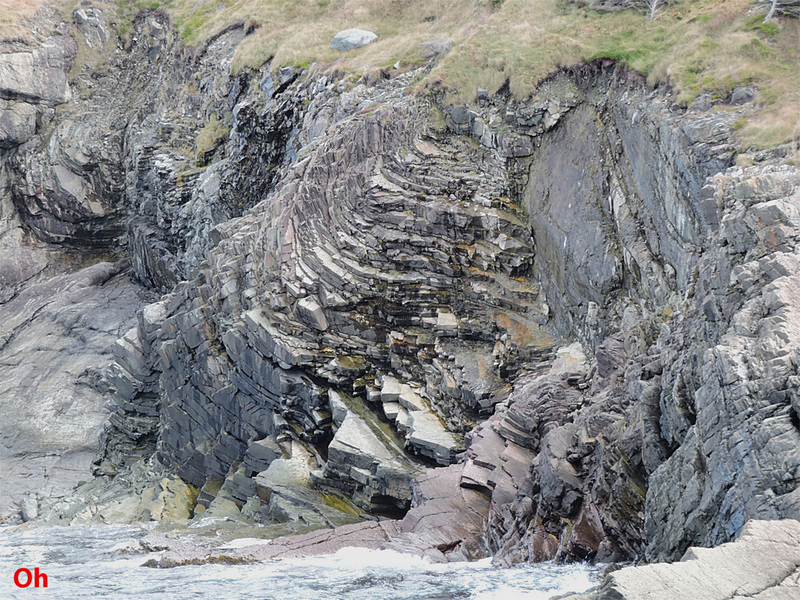 If present, such relatively weak and shear-strained layers would facilitate development of the curved failure surfaces which are seen in the photos following the folded bedding planes. 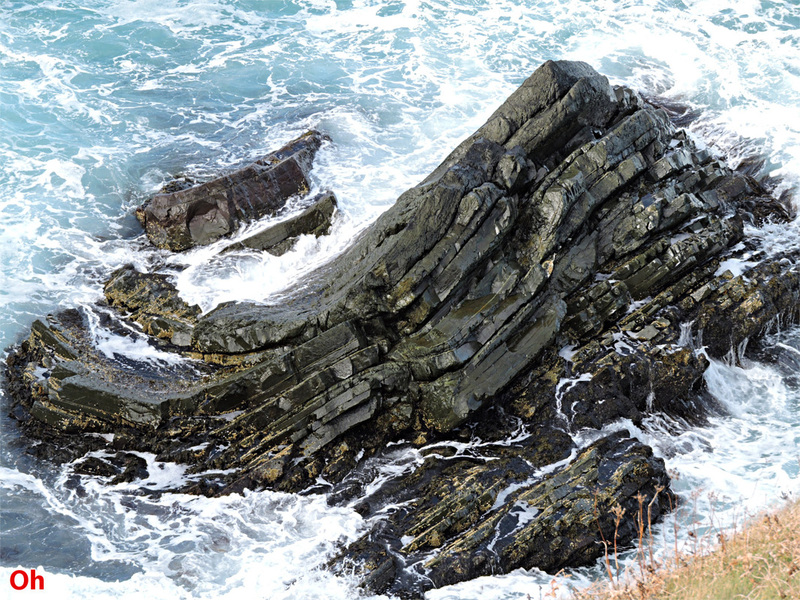 The photo below (height 50 cm) illustrates a joint set, likely caused by shear fracturing, in strongly folded sandstone near the two shoreline rock exposures seen above. The rock pictured above is of sedimentary origin and was laid down in the fast-flowing and variable fresh-water environment of an alluvial fan. Much of the rock consists of sandstone interspersed with layers of poorly sorted pebble conglomerate. Although the beds are tilted, there is little (but not zero) evidence of tectonic compressional jointing or shear. The sloping surface seen offshore is a failure surface along a bedding plane. 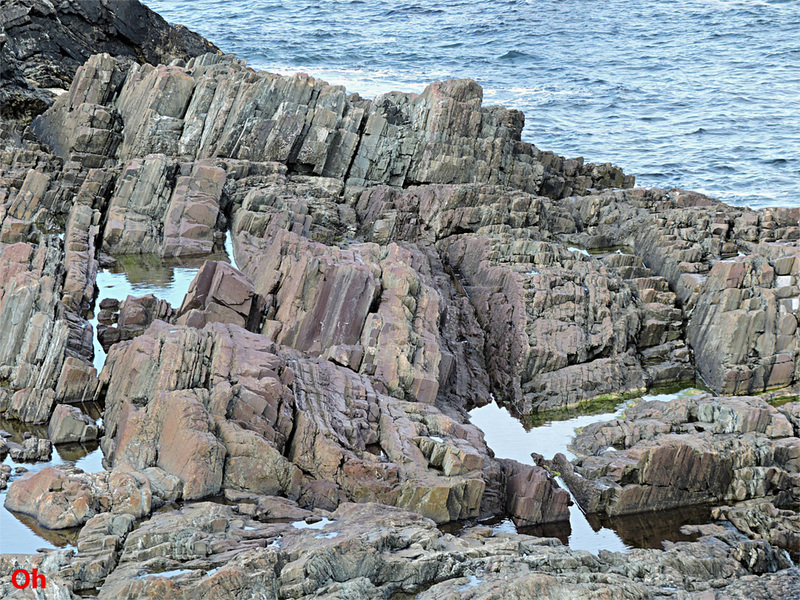 Similarly aligned bedding surfaces and joints can be seen in the onshore rocks. Wave erosion has removed a large volume of rock between the beds seen onshore and offshore, in spite of the well indurated and erosion-resistant nature of the sandstone and conglomerate. Clay-rich siltstone beds between sandstone layers may have played a role, but such beds are not presently visible, perhaps having been eroded entirely away. Shown left above are beds of sandstone interspersed with coarse pebble conglomerate from the previously illustrated sedimentary (alluvial fan) rock formation. The broken cliff is about 3 m high. A 50 cm high detail of the rock showing the erosion-resistant sandstone and conglomerate layers appears in the photo (right) above. 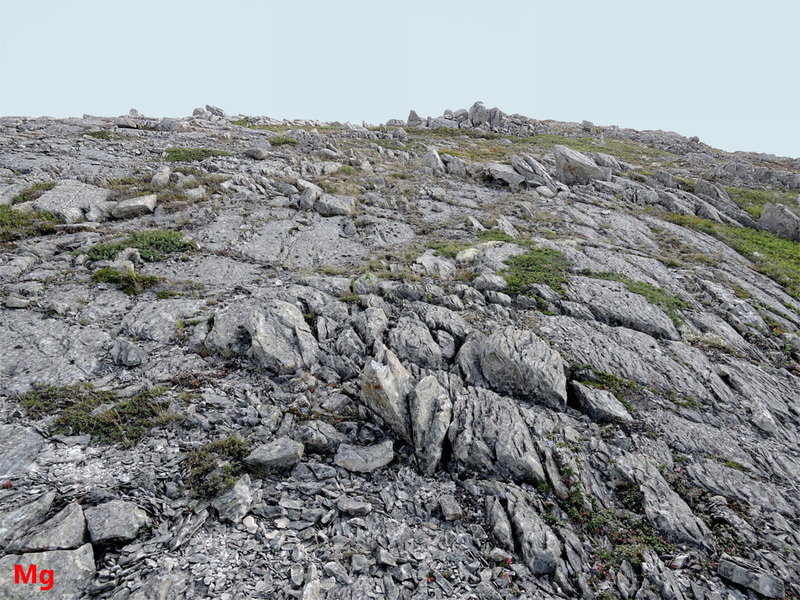 Bedding in this rock is indistinct, except for the widened, eroded joints seen sparsely placed in the left photo. These joints, the possible remnants of now-removed softer layers, control the shape of the entire small peninsula on which this rock is located. One side of the peninsula extends smoothly into the ocean along flat, tilted bedding surfaces, while the other side is a near-vertical cliff cutting downward across the up-sloping beds.